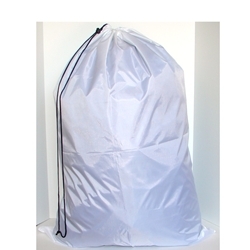 Mesh Bags 18" x 24"
Mesh Bags 24" x 36"
Mesh Bags 30" x 40"
This is our new white 30"W x 40"L heavy weight polyester laundry bag. It has an easy to use black slip lock closure that easily slides up to close and open the top of the bag. This white laundry bag will add a convenient way to manage your laundry. It is commercial grade and will work for either institutional or home use. It is great for the dorms! This website meets the PCI Credit Card Compliance Requirements. © AssistedLivingStore.com 2019. All Rights Reserved. Most of our products have Quantity Discounts. Make sure you click on each product to see volume discount savings!